The realms of physical matter, the spatial expanses of celestial raiment, and a temporal vector of evolution, are also being realized to deeply display a nonlinear, self-similar, organization. From quantum phenomena to interstellar clouds and galactic clusters, a fine grained, variegated yet analogous correspondence is increasingly being found by scientists and mathematicians worldwide. For an example, a 2012 paper that represents a breakthrough synthesis is Network Cosmology by Dmitri Krioukov and colleagues. Here is still another way that the encompassing cosmos of infinite procreative invariance is gaining its own anatomy and physiology. This image is from the Fractales site at http://fractales.free.fr. Nobel Prize in Physics 2016. www.nobelprize.org/nobel_prizes/physics/laureates/2016/press. This is the Royal Swedish Academy of Sciences press release about this award to David Thouless, Duncan Haldane, and Michael Kosterlitz for for theoretical discoveries of topological phase transitions and topological phases of matter. We chose it from many (Google title) to post a summary notice of this joint, multi-faceted achievement, which has broadly sanctioned a topological turn in theoretical physics (see Wolchover herein). For technical reviews, see Highlights of the Physics Nobel Prize 2016 at arXiv:1612.060132, and their Nobel Lecture on Topological Quantum Matter in Review of Modern Physics (89/4, 2017). Aerts, Diederik, et al. Crystallization of Space: Space-Time Fractals from Fractal Arithmetics. arXiv:1506.00487. Vrije Universiteit Brussel mathematicians post a 2015 update on a pervasive self-similar, scale invariant topology across every domain of cosmic phenomena. See also Relativity of Arithmetic as a Fundamental symmetry of Physics by coauthor Marek Czachor at arXiv:1412.8583. Aguirre, Jacobo, et al. Fractal Structures in Nonlinear Dynamics. Reviews of Modern Physics. 81/1, 2009. A technical tutorial which courses through various dissipative systems, with an emphasis on basins of attraction. Alexander, Stephon, et al. Fermi-Bounce Cosmology and Scale Invariant Power-Spectrum. arXiv:1402.5880. Theoretical physicists Alexander, Dartmouth College, along with Cosimo Bambi, Antonio Marciano, and Leonardo Modesto, Fudan University, China, contribute to the latest universe-multiverse scheme with usual technical vernacular. We also note as a mid 2010s exemplar of international collaborations as a worldwise learning and knowledge unto discovery proceeds on its own. SA is an African-American physicist, CB, AM, and LM have doctorates in physics from Italian universities, but are now researchers Fudan, where the working language is English. One might then muse, what mathematical or textual dialect is Nature actually written in, where does “scale-invariance” come from, is it an independent propensity? Acknowledgments — We dedicate this paper to Leon Cooper, whose work continues to inspire and challenge us. SA was supported by the Department of Energy Grant de-sc0010386. This work was supported by the NSFC grant, the Shanghai Municipal Education Commission grant for Innovative Programs, the Thousand Young Talents Program, and Fudan University. Anitas, Eugen Mircea and Azat Slyamov. Emergence of Surface Fractals in Cellular Automata. Annalen der Physik. Online October, 2018. In this German journal since 1799, Joint Institute for Nuclear Research, Dubna, Russia physicists, with other postings in Almaty, Kazakhstan and Bucharest, Romania describe a clever method for visualizing this topological presence. Our interest extends beyond the global research facility only now possible to a mindfulness that we phenomenal learners are witnessing an intrinsic geometry and mathematics, as Galileo and others foresaw, that does exist on its prior own. Such nascent realizations then one to wonder “whomever “put it all there in the first place. Ardizzone, Vincenzo, et al. Formation and Control of Turing Patterns in a Coherent Quantum Fluid. Nature Scientific Reports. 3/3016, 2013. An international 16 member team from Ecole Normale Superieure, Paris, Universitat Paderborn, Germany, Chinese University of Hong Kong, University of Arizona, and CNRS Laboratoire de Photonique et de Nanostructures, France, achieves an iconic portal unto the “systems nature” revolution. At once, as abstracts or first paragraphs can now state, a ubiquity of the same self-organizing, complex adaptive network patterns and dynamics have been found at each and every realm and instance. In this paper, they are similarly noted in these quantum reaches. By the breadth and depth of these findings, it becomes strongly evident that an independent, universal source must be at work. But is it an algorithm software, or might it actually be broached as a natural genetic code? Argyris, J., et al. 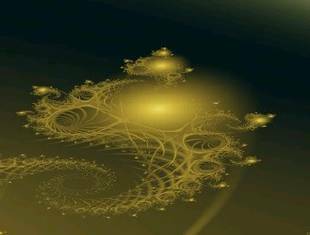 Fractal Space Signatures in Quantum Physics and Cosmology. Chaos, Solitons and Fractals. 11/11, 2000. How the topology of nature (space, time, matter, and fields) is “intrinsically fractal.” A self-similarity is then evident from galactic clusters to the allometric scale of life. Argyris, J., et al. Fractal Space, Cosmic Strings and Spontaneous Symmetry Breaking. Chaos, Solitons and Fractals. 12/1, 2001. A theoretical encounter with a finely grained, iterative universal genesis. Aschwanden, Markus. A Macroscopic Description of a Generalized Self-Organized Criticality System: Astrophysical Applications. Astrophysical Journal. 782/1, 2014. A technical tutorial upon this constant propensity of natural systems everywhere to become optimally poised between order and chaos. A physical definition of SOC is broached as “a critical state of a nonlinear energy dissipation system that is slowly and continuously driven towards a critical value of a system-wide instability threshold, producing scale-free, fractal-diffusive, with powerlaw-like size distributions.” In some translation, what kind of developmental universe does this describe, who are we earthlings as its way of achieving its own self-cognizance? Aschwanden, Markus. Self-Organized Criticality in Astrophysics: The Statistics of Nonlinear Processes in the Universe. Berlin: Springer, 2011. Since the 1990s, the author has been at the forefront of the study of celestial phenomena such as solar flares in terms of complex dynamical systems. The endeavor has spread across cosmic reaches with robust mathematical veracity to an extent that a book length treatment is now merited. An appropriate Introduction scopes out the science of SOC as broadly arrayed across Stellar Physics, Planetary Realms, Geophysics, Biophysics and onto Human Activities. On the Springer site can be found the table of contents, chapter abstracts, and text samples. Aschwanden, Markus. Self-Organized Criticality in Solar Physics and Astrophysics. http://arxiv.org/abs/1003.0122. A paper presented at the 2010 Interdisciplinary Symposium on Chaos and Complex Systems, in Istanbul, Turkey, which shows how nonlinear SOC, as a “universal and ubiquitous law” throughout nature, can be likewise found to hold for an array of celestial phenomena. The author’s forthcoming book on the subject Self-Organized Criticality in Astrophysics will be out in January 2011 from Springer. Aschwanden, Markus, ed. Self-Organized Criticality Systems. . Online at www.openacademicpress.de/ojs2/index.php/socs by a similar team that contributed to the ISSI (International Space Science Institute) document at arXiv: 1403.6528. Chapters such as SOC and Fractal Geometry by James McAteer, and Power Laws of Recurrence Networks by Yong Zou, et al, explain this propensity from cosmic to climatic realms.